After the first week of our Jeff Clow photo tour on the Oregon Coast, we headed inland for the weekend before the second tour. 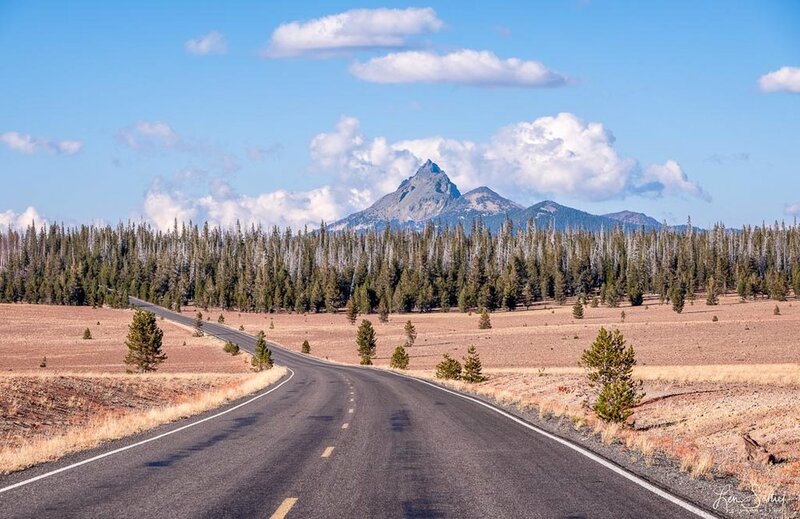 Our destination was Bend, Oregon, where we planned to explore the Cascade Lakes Scenic Byway as well as Smith Rock State Park. Before we left Bandon, we stopped at Tony’s Crab Shack in Old Town Bandon (the crab cakes are amazing) and had lunch. Before we left, I plugged in our destination into Google Maps and it came up with a route that took us over some back roads for our five-hour drive. About three and a half hours into our drive we saw a sign stating that Crater Lake was only three miles away. We followed the road, spent some time there and headed back toward Bend. As we left the park, we pulled over for this amazing scene. Here, Mount Thielsen rose from the landscape towering over the trees. The mountain is part of the Cascade Mountain Range.